Mardy Fish is playing on an ankle that's "75 percent," but that didn't stop him from defeating Germany's Bjorn Phau in his Citi Open opener. 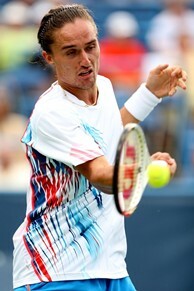 Second-seeded Alexandr Dolgopolov wasted little time in beating Italy's Flavio Cipolla, 6-1, 6-3 in D.C. Possibly feeling the effects of last week's Farmers Classic and cross-country travel, No. 8 Sam Querrey survived three tiebreakers to beat Igor Andreev 7-6 (2), 6-7 (2), 7-6 (2). WASHINGTON (AP) -- Mardy Fish passed on the London Olympics. Tommy Haas wanted in. The top-seeded American required big and timely serves to reach the second round. The fourth-seeded Haas advanced with relative ease. Fish rallied from an opening-set loss and beat Bjorn Phau 4-6, 6-1, 6-2 on Tuesday night in the Citi Open. Haas, an Olympic medalist denied a chance for a second, continued his impressive summer by defeating American qualifier Michael Russell 6-4, 6-2. No. 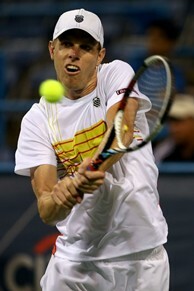 8 Sam Querrey survived three tiebreakers to beat Igor Andreev 7-6 (2), 6-7 (2), 7-6 (2). Fish, the 2004 Olympic silver medalist in Athens, entered this week on a gimpy right ankle, one he injured two weeks ago in Atlanta. He then tweaked the injury diving for a ball late in the first set on Tuesday. "It's 75 percent, but not hampering me in a bad way," Fish said. Down a set and struggling with his composure at 1-1 in the second, Fish fought off a service break by firing two of his 15 aces. "I get down a break there, you start questioning things, start feeling the ankle a little bit more," Fish said. "You'd be surprised how much better it feels up a break than down a break." Fish, who missed several weeks on tour earlier this year following a procedure to correct a heart problem, rattled off wins in five straight games to take the set. He won 10 of 11 games overall. "It was nice to sort of get the momentum there in the second set and keep it throughout the match," said Fish, who returned to the tour this summer by reaching the round of 16 at Wimbledon. Fellow seeded-players Alexandr Dolgopolov and Kevin Anderson also advanced with straight-set victories. On the women's side, top seed Anastasia Pavlyuchenkova of Russia eliminated Bojana Jovanovski of Serbia 6-4, 6-3. No. 3 Sloane Stevens moved into the quarterfinals with a 6-2, 0-6, 6-1 triumph over Michelle Larcher de Brito. Only a brief rain delay between sets slowed Haas, the last player to beat Roger Federer this year. The 34-year-old German never faced a break point and broke Russell's serve three times. Fish chalked up his no Olympics decision to scheduling despite an ``unbelievable experience'' in Athens. Haas, who won the silver medal at the 2000 Sydney Games, is still bothered by a decision made by others that denied him the chance to play at Wimbledon, the site of this year's Olympic tournament. The German Olympic Sports Federation rule states that players must be ranked in the top 24 in the world to participate. Ranked outside the top 100 most of the year, Haas is currently No. 36. "When I watch the Olympics, I'm still surprised I'm not there," said Haas, once the world's No. 2 player. "The German Olympic committee didn't nominate me, which was a big mistake in my eyes. That's life. That happens. I'm happy to play the same week while the Olympics are going on." "I think it's a special occasion, it's at Wimbledon," Haas said. "I was very disappointed not to be part of (this year's Olympics), but you forget about it now and try to worry about playing in the tournament." Ranked 13th in the world last summer and poised for a berth on the Russian Olympic team, Pavlyuchenkova struggled early this year and lost ground to others from her country. Rather than playing for gold, silver or bronze, she is aiming for her first title this year. "Because I'm here, of course, I'm 200 percent in this tournament and I'm happy to be here," said Pavlyuchenkova, after winning six of nine break point chances against Jovanovski. "I'm happy to have the opportunity to play another tournament while others play in the Olympics, so at least I'm not on holiday or just watching them play and win matches. "But definitely, of course, I'm a little disappointed because the Olympics is a very special event and everybody wants to play there." No. 2 Dolgopolov beat Flavio Cipolla 6-1, 6-3, and third-seeded Anderson downed Jurgen Zopp 6-3, 6-2. Dolgopolov needed less than an hour to dispatch Cipolla, breaking the Italian four times without dropping his serve. The 23-year-old player from Ukraine had lost his previous two matches against Cipolla, but relied on a blistering forehand to maintain control - including a nice passing shot on match point. Seventh-seed Benoit Paire lost his opening match 6-3, 7-5 to Tobias Kamke. No. 4 Vania King advanced to the second round, defeating Jennifer Elie 6-3, 6-4. Xavier Malisse, a Washington semifinalist in 2010, rallied for a 4-6, 6-2, 6-1 win over Paul-Henri Mathieu.